That is, the utility’s well-paid executives realize market forces are aligned against them. Consider, for instance, “the precipitous recent decline in natural gas prices and the decline in the cost of generating power at natural gas-fired power plants.” Other headwinds include the dramatic drop in renewable-energy installation costs and the flat growth in electricity demand because customers are cutting their waste by increasing efficiency. Moreover, the report points out how FirstEnergy’s power plants are old – and getting increasingly expensive to operate. As generators age, their maintenance costs rise, they need additional capital investments, and their performance degrades. Utility executives recognize these facts, too, and they’d prefer shifting those rising costs to their customers. The report also addresses the cost implications of the bailout. FirstEnergy claims its subsidies eventually will produce $561 million in benefits, yet IEEFA notes the utility has failed to make public its calculations and economic assumptions. Based on testimony before the PUCO, FirstEnergy is assuming natural gas prices will rise significantly, allowing their now-uneconomic power plants to better compete. As mentioned above, gas prices have been falling because new exploration and drilling technologies have increased supplies substantially. There is no sign of low natural gas prices going away. Using more realistic assumptions, IEEFA calculates the subsidies will result in extra charges – at the hefty price of $4 billion – rather than benefits. This staggering cost mirrors the $3.9 billion predictions of the Ohio Consumers’ Counsel. The same market forces that have reduced the value of these coal plants also apply to Sammis, Clifty Creek, and Kyger. FirstEnergy’s solution: transfer the costs and risks of those plants to customers. FirstEnergy claims its proposed deal would promote resource diversity, when it actually would merely subsidize the continued operation of uneconomic generating units and expose customers to significant risks. The intention of resource diversity is to reduce risk. 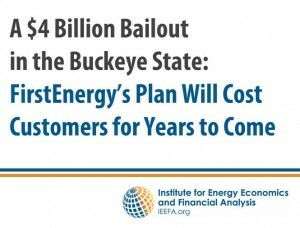 The bailout is a piece of FirstEnergy’s larger strategy to “re-regulate” (what we have called “re-monopolize”) some of its struggling power plants by shifting the costs and risks of those plants to ratepayers, while guaranteeing a 10.38 percent return on equity each year for FirstEnergy and its shareholders on the plants in question. 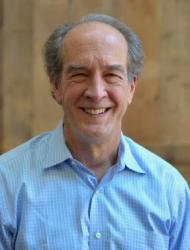 Higher returns mean bigger bonuses for executives and larger dividends for stockholders. The FirstEnergy proposal is “a bad deal for Ohio customers:” It would lock Ohio into subsidizing the continued operation of aging and uneconomic power plants, while hindering opportunities for lower cost and cleaner energy resources that could provide jobs and significant economic benefits for the state. Any which way you look at it, the subsidy plea only favors FirstEnergy – and leaves Ohioans to shoulder the brunt of the deal. Here’s hoping the PUCO commissioners read the report carefully. This entry was posted in FirstEnergy. Bookmark the permalink. Both comments and trackbacks are currently closed. One of these plants is not like the others … closing Davis-Besse would result in an increase in CO2 emissions and would be a step backward in fighting climate change, while closing Sammis, Clifty Creek, and Kyger Creek would be big climate wins.